How many times have you lost your cool and yelled at your children? I’m not proud to admit it’s been a challenge for me. I heard once that when you get married you see how selfish you are and when you have kids you see how angry you are. This is true for me. I’ve never considered myself an angry person. I forgive and forget, I don’t raise my voice to my colleagues or friends. But, if I’m being honest, it is so easy to do with my kids. Can you relate? It seems like most parents can! If you’re ready to avoid yelling and keep your cool, check out these 8 practical tips to help you stop yelling at your kids. “Could you please put away your toys and come to the table to eat?” I said calmly. “It’s time for dinner, will you please come to the table?” “The food is getting cold, it’s time to eat, let’s go.” I plainly said. “MOVE IT, LET’S GO, IT’S TIME TO EAT. HOW MANY TIMES DO I HAVE TO ASK YOU…” I YELLED! Oh, no, I did it again. I lost my temper. The situation got the best of me. In fairness, I did try to politely ask my strong willed child (children) several times. Why is it that they don’t seem to hear? I know I’m not alone. It’s clear parents yell… a lot. Why is it that the kids don’t seem to hear? I’ve wondered why kids don’t hear. I’m sure it’s not a physical issue, because the things I quietly say to my husband that I don’t want them to hear, they clearly hear. Kids don’t listen at times because of our tone and at other times because they anticipate what we’re going to ask. Additionally, how we interact with them throughout the day impacts whether or not they will “hear” us. For example, if we’re constantly nagging, correcting, or “withdrawing” from their emotional bank account, they learn to tune us out. We have to make sure that we’re showing them interest, listening to them, and providing encouraging words. It can be a balancing act. Lastly, if we’ve parented in such a way that there are no consequences for ignoring, not listening, then we unintentionally reinforce that it’s okay to behave this way. Let’s stop accepting our own undesirable behavior. Implementing a few positive parenting techniques can help you keep your cool and stop shouting when you’re angry. 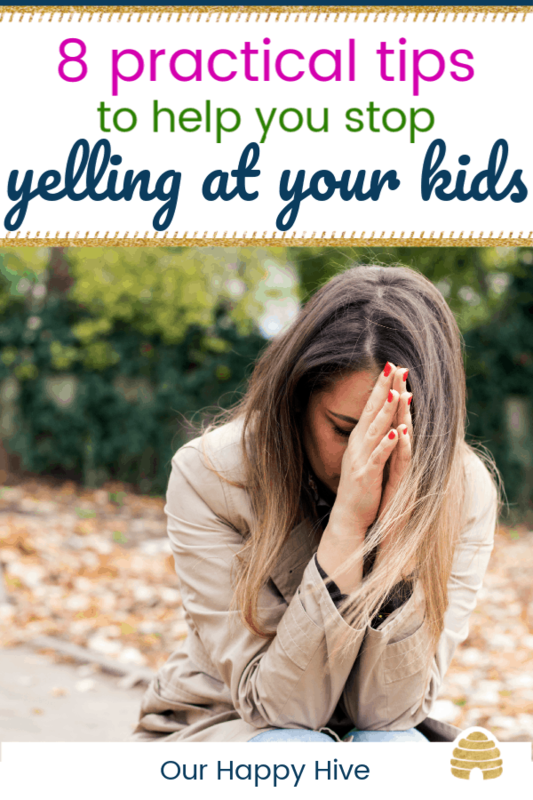 Check out these 8 tips to stop yelling at your kids! To begin, like a boy scout, we want to be prepared. Specific scenarios, attitudes, or circumstances may make you more stressed or more primed for anger. Pause and identify any common threads. For example, I am super time oriented, so if we have a packed schedule, I typically am not as patient and become frustrated more easily. Being aware of this in and of itself is quite helpful, but it also helps me to plan around it. At times, as parents, we may have unrealistic expectations for our kids or our family. I once learned this about obedience and the standards I had with my then four year old. I expected her to consistently obey right away, all the way, and with a happy heart. I would get frustrated with the endless correction she needed each day. During one visit, my parents lovingly encouraged me that my expectations were not realistic for her age. In that moment, I needed to recalibrate and define what I thought was acceptable so that I wasn’t constantly frustrated and on the verge of anger. One last tip we can do to prepare ourselves to not yell at our children is to role-play. I’ve seen Human Resource coaches role-play with managers about how to handle conflict with employees. I’ve role-played with my daughter how to avoid getting angry with another kid at school (and our practice paid off by the way). We can also role-play with our spouse what we’ll do the next time we want to get angry and yell at our kids. This positive parenting technique can be very powerful and help you know what to do the next time you reach that tipping point. If you’re wondering what types of things to role-play, keep reading! Just like when we get frustrated with our spouse, a friend, or a bad sales-person, there are really practical steps we can take to calm ourselves and avoid yelling. It’s easy to diffuse a tense situation by changing your tone. If you’re talking to your kids like a mad teacher, try to dial it back and talk more like a friend. Inject some humor to lighten the moment. You can also try speaking softly. This technique is great for getting their attention and setting the stage for how your children will respond to you. If you have a partner and things are getting heated between you and the kids, then take the opportunity to pass the baton. There is no shame in tapping out and having someone who is fresh and not at the tipping point come into the dialogue. When you do Tip #3 – Role-Play, be sure to discuss how you’ll transition in a heated moment and how one of you can take over for the other. Remember, your commitment is to positive parenting and to avoid yelling! They say that hindsight is 20/20. It’s hard to get perspective in the moment, but if you can reflect beforehand have a poignant moment you bring to mind before bubbling over, then it’s helpful to remind yourself how you felt about your parenting or about your relationship with your child the last time you yelled. It’s also helpful to put yourself in their shoes. How might they feel when you yell at them? What are your actions conveying about respect, their value, or how to manage anger? Ideally, we will be able to have our children listen and positively respond to our requests. As a trained facilitator of 20+ years, I know there are ways that we can position our body that can be subtle but uber effective at getting the attention of others. For instance instead of talking to your kids from across the room physically move closer, like right next to them and talk. If they are still distracted, place your hand on their arm or shoulder as you talk to them. Last but not least, get on their level. If they are shorter than you, squat down, look them in the eye and in a quiet tone make your request. As parents, we are responsible for creating the atmosphere in our homes. We can either be a thermometer reading the temperature or a thermostat that sets the temperature. How is yelling working for you? Have you seen lasting results, behavioral change, or only short-term compliance? More importantly, how has yelling impacted your relationship with your children? If we get angry and yell, you can bet our kids will yell when they are angry. I’ve heard that kids are excellent observers and poor interpreters. We may think they are little adults and that they understand why we’re angry, but often, they don’t. They just think it’s because they are “bad” or because “mommy” doesn’t like them. Commit to one or more of the above 8 practical tips to stop yelling at your kids. By preparing in advance, you will have a plan and approach to implement the next time you encounter a pressure-cooker situation. Practical steps like changing your physical response including tone, physical location, and physical touch, you’ll have a better chance at getting your child to pay attention and hear you. Parenting is tough, and most of us learn “on the job!” We come into this gig with little training and for some, poor role models. But we don’t have to settle and accept yelling as normal or the way things are going to be in our home. Little by little, we can change and affect the climates for our children.